Let’s be honest, the building industry is not for the fainthearted! At every corner of your journey as a building professional, there will be many pit falls and traps that can cost you thousands. Too often good builders and businesses are dragged down through a lack of support or unexpected hurdles that exist in this tough and uncompromising industry. To be successful, a builder must learn to Master multiple mechanisms in an ever-changing environment. You can’t possibly do this on your own, and the good news is, you don’t have to. When you become a part of RBN, you’re not a member, you’re a Mate. 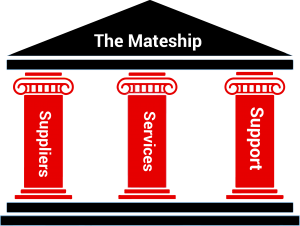 The Mateship gives builders access to the Suppliers, Services and Support required to run a successful business. It also gives builders the opportunity to learn from other builders – the highs, the lows, the wins and the losses. It is a network of relationships, with support at its core. RBN was born from a passion to see builders succeed. RBN was founded when working alongside builders who were striving to obtain their builders license. RBN’s founding company, Builder Registration, achieved such great success with helping builders get registered – but discovered that obtaining a license was only the beginning of a builders journey. Owning a successful business in the building industry takes far more than a license. It takes hard work, commitment and continuous improvement. A builder must be willing to develop themselves professionally and personally – connecting with the people who can help them do so. In the same way that Builder Registration supports builders to accomplish the feat of Registration, RBN supports Builder’s to realise their business aspirations. Most people say don’t go into business with friends, but Mates have always got your back. The 3 Pillars form the foundation of what we do. We house the SUPPLIERS, the SERVICES and the SUPPORT that every builder needs to succeed in business. We build great relationships with exceptional SUPPLIERS and SERVICE providers. This means good service and exclusive rates for our Mates (we call them, Mates Rates). Have a browse of the Supplier Mates section of our website to find out more. We don’t do members, we house Mates. The Mateship is a culture of care. When our Mates need some help, they know who to call. Whether they have a general question or a technical question – we are always ready to listen and respond. We keep our Mates in the loop, updating them monthly with industry insights, hosting events, organising mate catch ups, coordinating training sessions and continuously innovating. If you’d like to find out more about what we’re up to, then send us an e-mail or give us a call.